The origins of chocolate, which is derived from the Theobroma cacao tree, stretch back at least 4000 years. "The True History of Chocolate" describes the origins of the word "cacao" as coming from the Maya of the Yucatan Peninsula and neighbouring Central Americas. The Olmec (from the southern part of Veracruz and Tabasco) are described as being the first to domesticate the plant. The Aztecs apparently regarded cacao as being of divine origin ('Theobroma' means 'food of the gods'). They used the tree's beans as currency - 100 beans would buy a slave, 12 beans the services of a courtesan and 10 beans a rabbit. The Maya created what we now know as chocolate by fermenting, drying and roasting the beans and then grinding the kernels to produce cocoa mass (chocolate liquor). According to a Monograph published in 1891 by Walter Baker and Company and now available as an e-book through Archive.Org, "the first references to the chocolate-plant and its products are found in the accounts of the explorers and conquerors who followed Columbus. These first descriptions of this singular tree, of its fruits and seeds, of its uses and the methods of cultivation, are remarkably accurate in all essential particulars." Christopher Columbus is thought to be the first European to carry beans back to Europe (around 1502) but they were as curiosities. The introduction of chocolate to Europe has been traced to Dominican Friars who in 1544 took a delegation of Maya to visit Prince Philip in Spain and they carried receptacles of beaten chocolate as gifts. Chocolate, coffee and tea are believed to have arrived in England at roughly the same time. When Cromwell's forces captured Jamaica from the Spanish in 1655 there were already flourishing cacao "walks" that lasted until a 'blight' caused their demise in the 1670's. 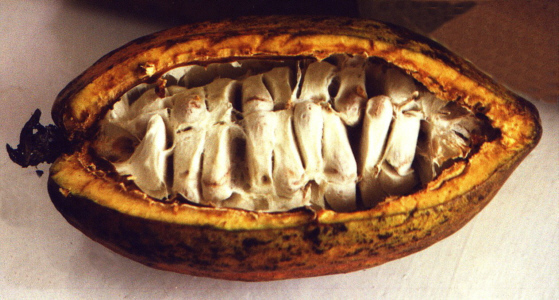 Jamaica was the main supplier of cacao to England during this period. Initially, many Europeans did not particularly like the Aztec delicacy of "chocolate"- a thick cocoa drink laced with ground chillies and dyed red with annatto to look like blood. Chocolate drinks were developed in Spain that were seasoned with pepper, vanilla, sugar and cinnamon or mixed with beer or wine. They became such a hit that Spanish society ladies had them served during Mass. When the French latched on to it, they immediately hailed it as a wondrous aphrodisiac and, by slapping heavy taxes on it, further enhanced its status as a drink for the rich and decadent. It is recorded that Sir Hans Sloane was introduced to cocoa as a drink in Jamaica during his stay in the 1680's. He apparently found it 'nauseous' but by mixing it with milk made it more palatable. He took this chocolate recipe to England on his return where it was manufactured and at first sold by apothecaries as a medicine. Much later, Cadburys manufactured chocolate using Sloane's recipe. In 17th and 18th century England, the drink became so popular that chocolate houses threatened the existence of the traditional English pub. The first commercial chocolate factory in the UK began in Bristol in 1728, owned by Walter Churchman. After the death of Walter and his son Charles, who took over from him, the patent and recipes were purchased by Dr Joseph Fry (around 1761). Fry died in 1787 and the business was then operated by his wife Anna and later by his third son, Joseph Storrs Fry (J.S. Fry). The first primitive version of the chocolate bar is credited to J.S. Fry and Son, when in 1847 they mixed sugar and cocoa butter with chocolate powder to produce a dry, grainy and not particularly tasty solid slab. Milk chocolate was a much later invention and the eating chocolate of today began in 1876 when Henri Nestle and Daniel Peters added milk and extra sugar to create the world's first milk chocolate bar. Later still the American, Milton Hershey became the first to mass produce chocolate when in 1894 he began selling the world's first Hershey Bar for five cents. For more information on the Hershey story, connect to Hersheys web site. Some of this information was found in an article from the Sydney Morning Herald by Sigrid Kirk, don't have a record of the page or year... (1993??). Thanks to Dr Roy Tasker, UWS, Nepean, a confirmed chocaholic, for providing a reprint. "The True History of Chocolate" by Sophie and Michael Coe, Thames and Hudson, Ltd, London 1996. "The Chocolate-plant (theobroma cacao) and its products", Walter Baker and Company, Dorchester, Mass, USA, 1891. "Chocolate" by Judy Miller, Chem Matters., 16, 1986. "The Effects of the Organic Acids in Cocoa on the Flavour of Chocolate" by C.S. Holm, J.W. Aston, K Douglas in J. Sci. Food Agric., 1993,61, 65-71. "The acid test for chocolate" by K. Douglas, J Aston and C. Vosten in Chem. in Aust.,1995, 19. "Chocolate, Cocoa & Confectionery: Science & Technology", B.W. Minifie, AVI Publishing Company, INC., Westport, Connecticut, USA, 2nd Edition, 1980. "Chocolate-melting the myths", D. Gaskell, Chem. in Brit., 1997, 33, 32-34. "The science of chocolate", S.T. Beckett, RSC. Paperbacks, Cambridge, 2000. The genus Theobroma consists of some twenty species. 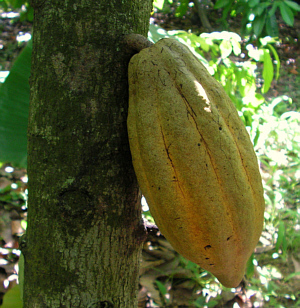 The only one of commercial value, T. cacao, is divided into two main groups, termed "Criollo" (most likely the original variety domesticated by the Maya) and "Forastero". A third group known as "Trinitario" which is basically a cross between these two originated in Trinidad around the 1740's. Forastero can be considered "ordinary grade" and is the most important commercial type. The Trinitario and Criollo types are known as "Fine" and "Flavour" cacaos and at one time commanded premium prices from the chocolate manufacturers. The countries which traditionally produced the majority of these "Fine flavour" cacaos are Ecuador, Venezuela, Trinidad and Tobago, Grenada, Jamaica, Sri Lanka, Indonesia as well as Samoa. However, production figures for these types have now dwindled to the point where they constitute less than 7% of the total. It is second only to forest in protecting the soil from erosion by the inter-locking of the foliage of adjacent trees. It will grow well on steep slopes which need protection. It is less subject to praedial larceny than other crops. It is easier to reap and sell than other crops. Animals find the husks from its pods attractive as feed. When planted under coconut trees, it suppresses weeds, thereby significantly reducing the cost of weeding. There is only one disease affecting Jamaican cocoa - Black Pod Rot. However this may be severe in areas with heavy rainfall and on the lower sides of narrow valleys. Cocoa costs less to maintain than other crops. Cocoa is the easiest tree crop to progagate. 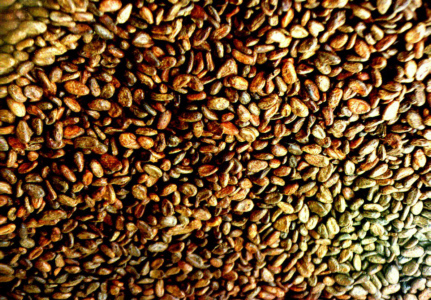 There are central fermentaries to process the Jamaican cocoa crop. A big advantage of cocoa as a crop is that even in a massive hurricane such as Gilbert (1988), only a small number of trees are totally uprooted and killed. Although foliage is lost from trees and they may be partially uprooted, the bulk of the trees do not perish. Cocoa trees may yield 20-30 pods a year each containing 30-40 beans. The cocoa plants supplied to Jamaican farmers are crossed between PA 150 with ICS 1 or PA 150 crossed with ICS 60, which yield around 67-75 boxes per acre in their sixth year, before coming into full bearing. ICS 1 is the variety most resistant to Black Pod Rot and holds the world record for yield from an acre. In 1970/71, an acre at Orange River yielded 147 boxes (3,316 lb dried) and had a five year average of 114 boxes. It takes seven years for cocoa to come into full bearing and good yields can only be achieved by reducing overhead shade, pruning and by controlling Black Pod Rot disease and rats. "Spotlight on Cocoa"- Pt 1 The Gleaner Sept 2, 1995 pg 9B. "Spotlight on Cocoa"- Pt 2 The Gleaner Sept 9, 1995 pg 9B. 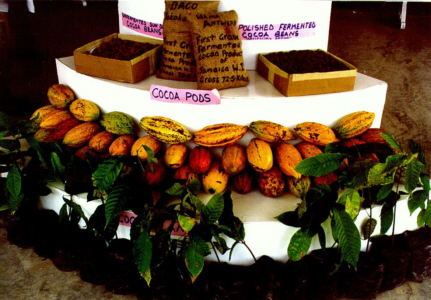 articles by the retired chief Cocoa Agronomist at the Cocoa Industry Board, Brian Topper. The unfermented wet beans, taken from the pod, lose about 65% of their weight and the final moisture content is optimally 6%. The traditional West African "heap" fermentation process begins by taking the wet cocoa beans and heaping them on banana or plantain leaves spread out on the ground. They are then covered by more leaves and left to ferment for 5 to 6 days. During this time the pulp and astringency of the beans is removed while the chocolate flavour starts to develop. When fermentation is complete, the beans are dried and then roasted (the length of the roasting time depends on whether the final use os for cocoa or chocolate). 2-phenyl-5-methyl hex-2-enal and 3-methyl butyl cinnamate. Each of these contain an aromatic nucleus (A), a branched aliphatic chain (B) and a functional group (C). 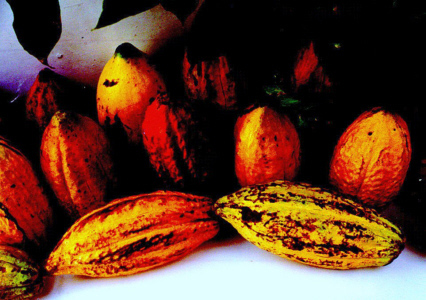 A study of 75 compounds with a more or less cocoa flavour found the following features: A, B and C present, 65%, A and C present 80%, A or B present, 90%, C present 90%. M. van Praag, J. Agric Food Chem., 1968, 16, no. 6 , 1005. Recently, biochemists have isolated anandamide from chocolate and cocoa powder. The compound is thought to be the endogenous ligand for the cannabinoid receptor, the receptor that binds THC and is responsible for the narcotic effect of marijuana. For more information, see for example a WHO paper on cannabis. Other substances in chocolate that have been discussed as pharmacologically significant in terms of creating chocolate highs or addiction include: histamine (0.04 - 0.13 %W/W), serotonin (0.620 - 5.82 %W/W), theobromine (< 1.3 %W/W), tryptophan, phenylethylamine, tyramine and salsolinol. However, many of these occur in higher concentrations in other foods with less appeal than chocolate and so if there is a psychoactive effect in chocolate it is probably not due to their presence. Copyright © 1995-2014 by Robert John Lancashire, all rights reserved. Created Aug 23rd 1995. Links checked and/or last modified 8th August 2014.